KellyConnect continues to hire Chat Agents and list the job on its site. Several RRRebels have been hired there recently. KellyConnect KellyConnect is hiring more work from home Chat Reps. No state hiring restrictions mentioned. Many RRRebels have been hired at Kelly over the years, and overall reports have been positive. 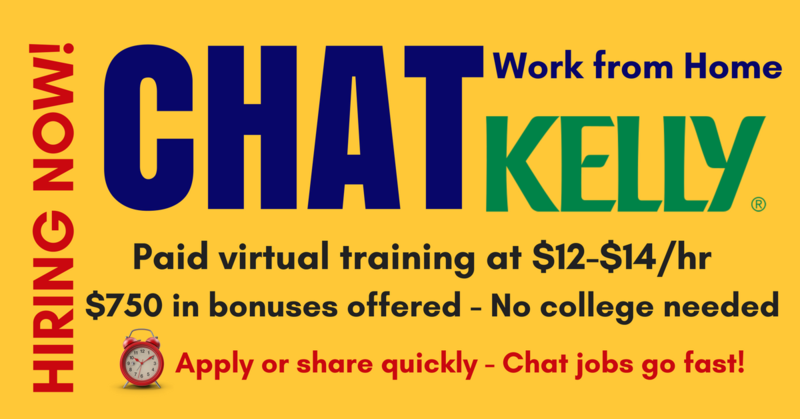 They offer paid virtual training at $12-$14 an hour, with a potential $15-$17/hr. after training, the company says. After 90 days you’re eligible for a $500 tenure bonus and a $250 performance bonus. You don’t need a tech background, though the official title of the role is Chat Technical Support Advisor. Our Chat Technical support Advisors provide customer service to resolve technology questions, challenges and problems through a series of trouble shooting activities in a virtual call center environment. Common solutions include resolving username and password problems, data sharing & synchronization, uninstalling/reinstalling basic software applications, verifying proper hardware and software configuration and set up, power cycling devices, navigating customers through application menus, and troubleshooting email issues. This is a performance based organization where all calls are recorded, monitored, and coached on a daily basis. You will be responsible for support of computers, operating systems and mobile devices (smart phones, tablets, and MP3 players). To go to the jobs and to apply, click here, then scroll down. For more jobs like these, check our Newest Jobs & Gigs page. To be the first to hear about jobs like these, like our Facebook page and check your feed for our posts. May you be working from home soon! This entry was posted in Chat Jobs, Hiring Companies, Jobs That Don't Require a College Degree, Work at Home Jobs. Bookmark the permalink.